Waves crash in the background as I sit down to write and I’m definitely in paradise surrounded by palm trees and warm ocean breezes. Still, I can’t stop thinking about a very different kind of paradise I was in last weekend. There was no swimming, snorkeling, or sun bathing but there was something just as enjoyable and maybe a bit more magical; there was snow! Mountains and mountains of snow. 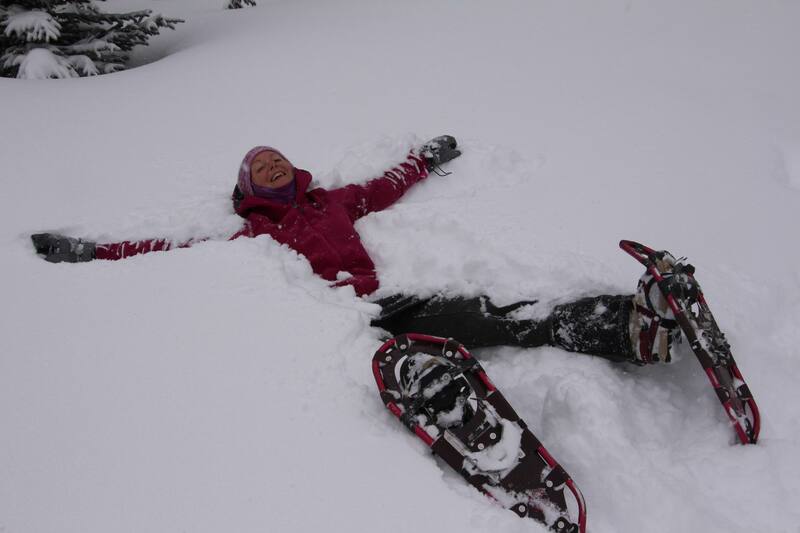 Snow to play in, make snow angels in, ski or snowshoe in, and snow to lose yourself in. The locals where I am now are actually jealous when I tell them about my experience in the Canadian Rockies last weekend. They wish they could see snow, dream of touching it, and wonder what it would feel like to lean back and fall into something deep enough to bury you. I used Calgary, the biggest city in Southern Alberta, as my jumping off point for last weekend’s excursion to nearby Kananaskis Country at the edge of the Canadian Rockies. While the beauty of Banff and Lake Louise is advertised worldwide for reason, Kananaskis still has a rugged, natural feeling that has captured my heart. I call it my playground and don’t think I could ever live more than an hour away from the nearby town of Canmore which provides access to some of the best hiking and skiing in Kananaskis. It was the Spray Lakes region of Kananaskis along the Smith-Dorrien Spray Trail that we chose to explore for 2 days of snowshoeing over the weekend. Accessed easily out of Canmore, it would typically take less than an hour from this mountain town to reach our lodge for the night. (Less than two hours total from Calgary.) Our trip was made a little more exciting due to a crazy winter storm we had to dive through, slippery roads threatening to send us into the ditch at every twist and turn, along with an avalanche road closure out of Canmore requiring an alternate route for our journey. Nothing like an adventure to really start a weekend off! Our lodge for the weekend, winter paradise, and new favorite destination in Kananaskis was Mount Engadine Lodge, a place so secret and tucked away that few locals even know of its existence. The Lodge is trying hard to change that with their Music in the Meadow concert series in the summer but it is still well off the beaten path and incredibly remote. While you can drive right up to the front door of Mount Engadine Lodge, it definitely feels like a backcountry ski lodge. As with most backcountry catered lodges, you’ll eat meals together as a group, share the common areas by the fireplaces playing games with new friends, and enjoy all-inclusive amenities during your stay(alcohol is the only thing you’ll pay for). The twist however is that you’ll also have a luxurious bedroom complete with king-sized bed and private bathroom. Nothing is skimped at this upscale lodge and you’ll even be able to take a shower at the end of your day. There’s electricity, heat, and every comfort to make you feel as if you were in Canmore itself. Looking out the window from Mount Engadine’s wrap around deck, you’ll stare wide-mouthed at scenery so stunning you can’t help but grab your snowshoes or skis and run out the door to play as soon as you arrive – which is exactly what we did as no snow storm was keeping us inside! We headed out for a short snowshoe, not wanting to miss afternoon tea, and found ourselves on the lodge’s maintained Spruce Loop. It was a short loop but gave us an opportunity to get outside after our drive, test how deep the snow was, and even make a snow angel or two. The Lodge had recently seen at least 8 inches of fresh snow in the previous 24 hours so we found ourselves in a fluffy white paradise with snow still swirling around us as we hiked. We arrived back at the lodge for tea to find a giant feast laid out for us complete with coffee and tea, home-made soup, a variety of cakes, pastries and sweets, along with chips and fresh salsa. We gorged ourselves silly despite having burned very few calories on our short hike. Now we knew we’d have to push it the next day with a real workout. Dinner was another decadent meal a few hours later and featured the best lamb I’ve ever had. There was fresh bread, cauliflower that actually required second helpings (yes, really), and a quinoa salad that converted me to a quinoa lover. Finally, the gluten-free chocolate cake was as good as any flour cake I’ve ever had – maybe better. We spent a quiet evening playing games by the fire and retreated to our beautiful suite for a peaceful sleep where we never heard a single noise until morning. I’m pretty sure I could return to Engadine Lodge just to catch up on rest. Monday morning arrived with a breakfast buffet that could compete with the best front-country lodges in Canmore. We were then invited to pack a lunch for our adventures on the trail that day. Most guests would have been returning for afternoon tea again but as this was our last day, we made sure to pack hearty sandwiches to get us home after our big snowshoeing adventure we had planned. Before leaving however, we couldn’t resist exploring the meadow outside the lodge. The lodge has a good collection of snowshoes for guests so even if you plan to ski during your visit, I highly encourage a short hike right outside the door. After all, it isn’t that often where you can snowshoe right out the door of your hotel and find yourself in snow so deep that one step off the path finds you up to your waist struggling to move. We were fortunate to stay on firm snow for the most part and only had a few moments of floundering in the deep snow. We got to see the lodge from a different vantage point and wonder what it would look like in summer with moose and deer roaming around the same meadow we were hiking across. We probably could have just done a complete circle of the meadow, taken a hundred photos of the surrounding snowy peaks, retreated to the lodge for coffee, and called it a fabulous day! We had a bigger objective though and wanted to visit the popular Chester Lake trail further up the road. 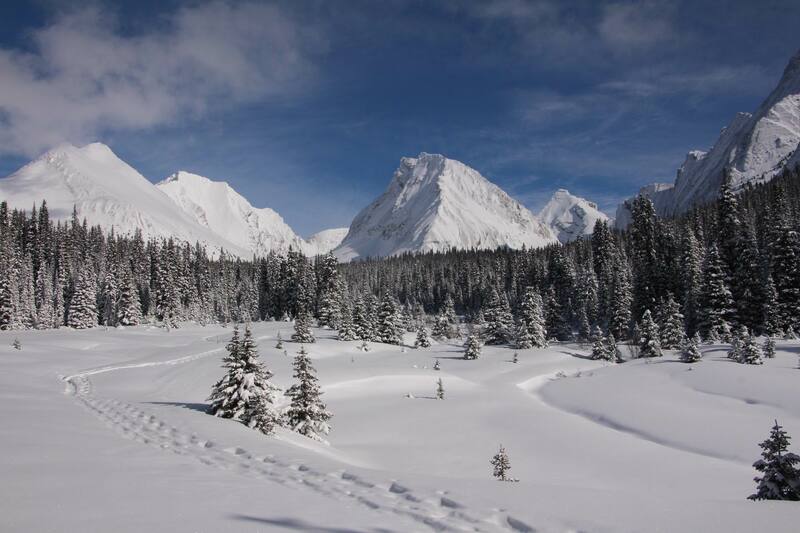 A short drive away, it is one of the most beautiful places to hike, ski, and snowshoe in the Spray Lakes Region. It’s also a safe option for adventurers of all abilities with little to no avalanche risk and well signed trails for both skiers and snowshoers. I’d been up to Chester Lake many times on skis but had always wondered what it would be like on snowshoes. I’d seen the snowshoe trail from a distance from the meadows near the lake and it always looked prettier than the ski trail, more open, and worth exploring. 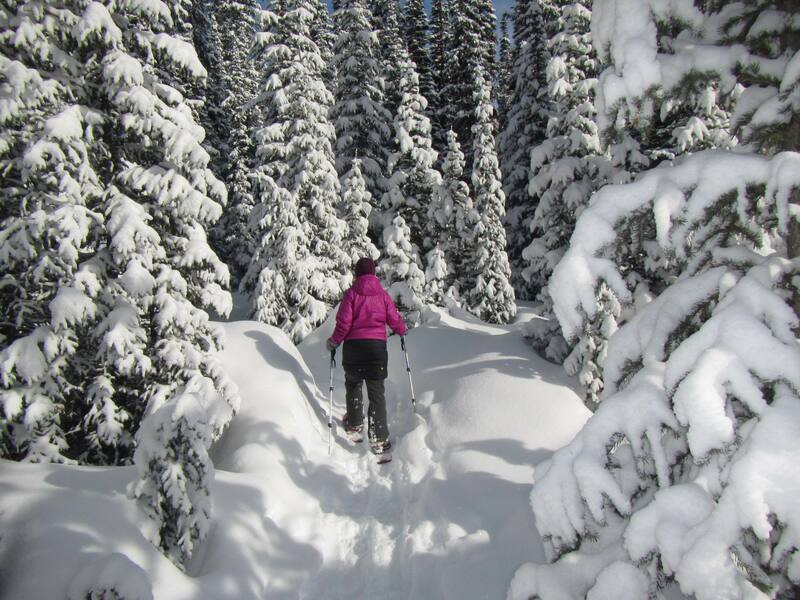 The 6 mile return trail to Chester Lake and back is rated as an intermediate snowshoe trail and currently has a snow depth of 53 inches of snow in March. While steep in places, it is never an extreme trail in any way and most people with a good fitness level would have few problems with the trail. Bright orange trail markers every few feet ensure you won’t get lost and you won’t find any skiers on your trail threatening to take you out on their descent. 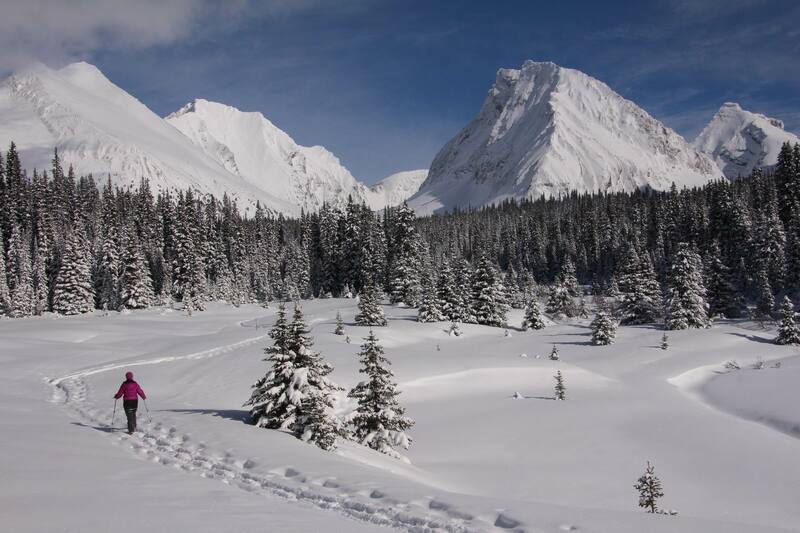 I’ve done snowshoeing and skiing all over Kananaskis and Chester Lake will always be my favourite trail for scenery and consistency of good powdery snow. While other trails may take you higher above treeline, you would need avalanche beacons to complete the journey and would have to budget for a full day out. Meanwhile, we completed the Chester Lake trip by mid-afternoon and got home to Calgary well before dark. I’m hoping the photos shown here describe the majesty of Chester Lake better than my words ever could. 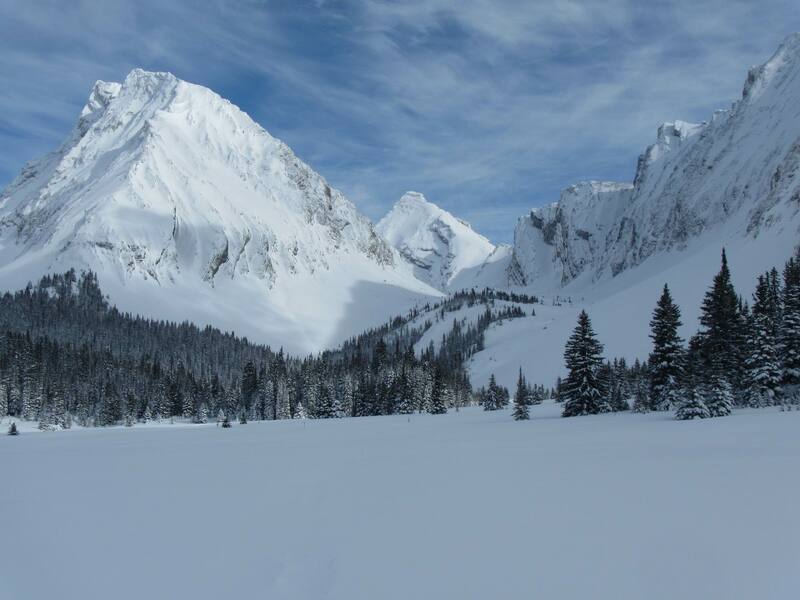 Snowshoeing to the lake definitely provided a different perspective from past ski trips and I kept stopping to say, “wow!” as we’d enter one beautiful meadow after another – each more spectacular. While the day was cold, we had the perfect clear blue sky day for the trip, quite the contrast from the snowy day before when views were limited to other members of your hiking party. Temperatures required a very short lunch break and speedy return back down the trail to our car, but I’d love to return on a warmer day and take some time to sit by the lake and soak it all in a bit longer. This Mount Engadine Lodge/Chester Lake trip could easily become an annual tradition. I’ve been all over the Canadian Rockies and you’d be hard pressed to find too many places more scenic and enjoyable for a day trip than Chester Lake. 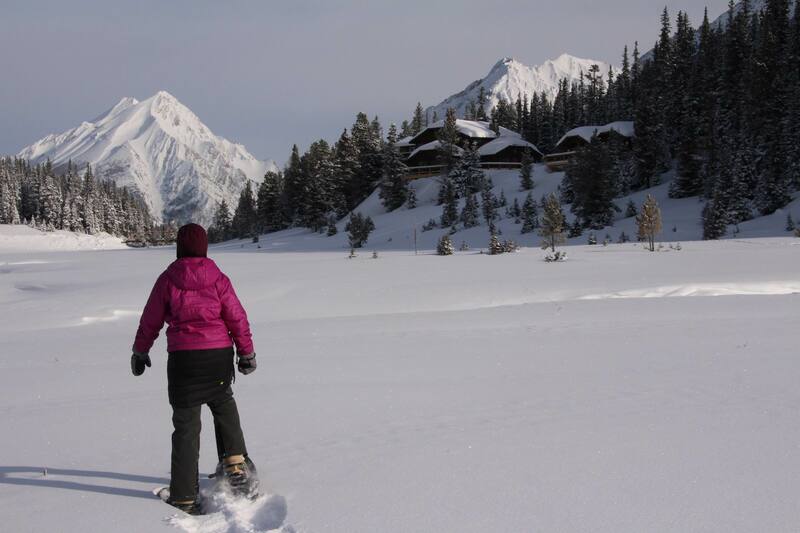 Combine your snowshoe trip with a stay at Mount Engadine Lodge or any of the fabulous lodges in Canmore and you have an award-winning weekend. If you choose to stay in Canmore, at least make the visit to Engadine for their afternoon tea. The price for drop-in guests is very affordable and tea is served every weekend for visitors. You’ll get to savor the same views overnight guests do from the dining room and the staff is always eager to welcome future guests in for a peak around their piece of mountain paradise. 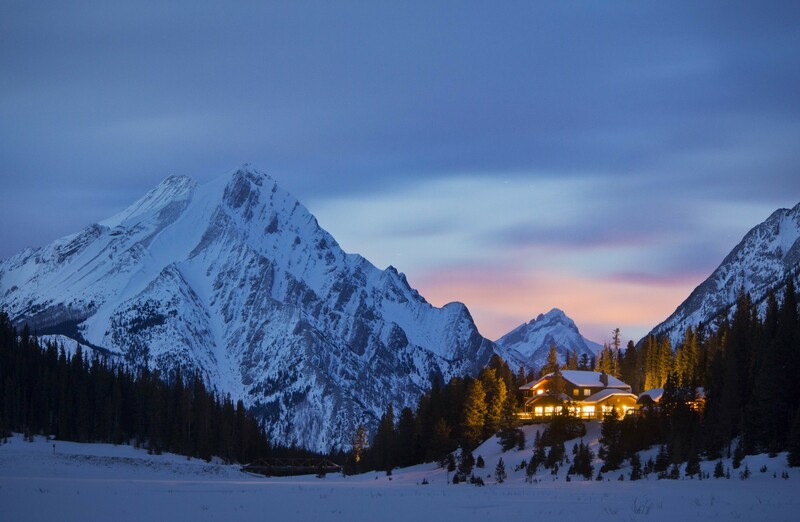 For more information on Mount Engadine Lodge, please visit the Mount Engadine Lodge website . For information on the Kananaskis region of the Canadian Rockies, visit the Travel Alberta website . Disclaimer: Travel Alberta graciously sponsored our trip to Mount Engadine Lodge for this story. As always, all thoughts and opinions are entirely my own. This entry was posted in Destinations, Features, Homepage Featured by Tanya Koob. Bookmark the permalink.